Japan's second nuclear reactor in the quake-stricken north experienced serious troubles on Sunday after its emergency cooling system failed, triggering a fresh radiation threat, a day after a blast rocked the site following a massive quake and tsunami in which thousands of people are feared dead. The Fukushima power plant's operator said pressure was rising inside reactor No. 3 after it lost its cooling system. The development came on a day tens of thousands of people were evacuated from the area after a blast and leakage from the No. 1 reactor at Fukushima, 240 km north of capital Tokyo. The explosion had blown off the roof and walls around the reactor. According to the International Atomic Energy Agency, an estimated 170,000 people had been evacuated from the area around the plant. Tokyo Electric Power Co, which runs the power station, notified Japan's nuclear safety agency that the radiation level at the Fukushima No. 1 nuclear power plant had exceeded the legal limit. Hourly radiation at the site was measured at 882 micro sievert, in excess of the allowable level of 500, Kyodo news agency reported. 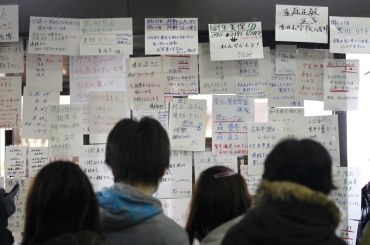 The nuclear safety agency also said the Tokyo Electric Company acknowledged that the No. 3 reactor of the Fukushima plant had lost its cooling functions, while at least 22 people are known to have been exposed to radiation near the plant since Saturday. The No. 3 reactor had lost the ability to cool its core and was now in the process of releasing radioactive steam, Chief Cabinet Secretary Yukio Edano said. 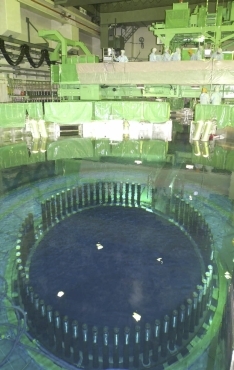 It was the sixth reactor overall at the Fukushima No. 1 and No. 2 plants to undergo cooling failure since the massive earthquake and tsunami struck Japan on Friday. In the small town of Minamisanriku alone, about 10,000 people, over half the town's population, remained unaccounted for, Kyodo said. 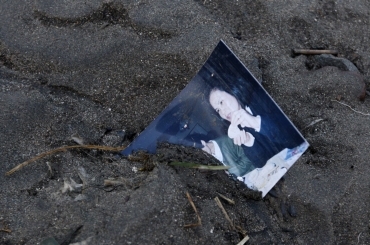 In Fukushima Prefecture, over 600 bodies had been found in both Fukushima and Miyazaki prefectures. In Miyagi, nearly 4,400 people had been sheltered in schools, hospitals and inns in the tsunami-swamped town of Onagawa and neighboring Ishinomaki city, local officials said. 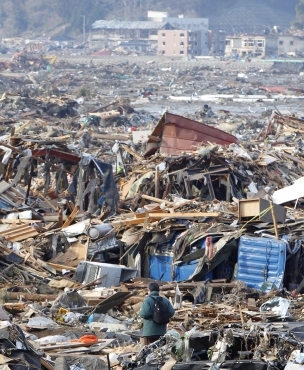 In Iwate Prefecture, north of Miyagi, many bodies were found on Sunday morning under the rubble in Rikuzentakata city. 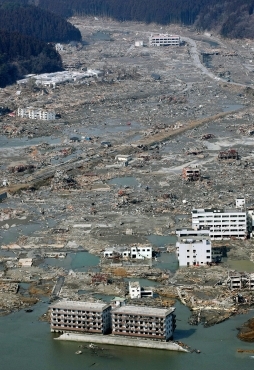 Nearly 5,000 houses in the city had been submerged by the quake-triggered tsunami. The local governments had been unable to contact thousands of people, police and local officials were quoted as saying. Japan has, meanwhile, revised the March 11 quake's magnitude to 9.0, the strongest to hit the country. Japan's worst previous earthquake was of 8.3 magnitude and killed 143,000 people in Kanto in 1923. A magnitude 7.2 quake in Kobe killed 6,400 people in 1995. The latest disaster raised fears of radioactive leaks from the nuclear plants after cooling systems there were hampered, most seriously at the No. 1 reactor. 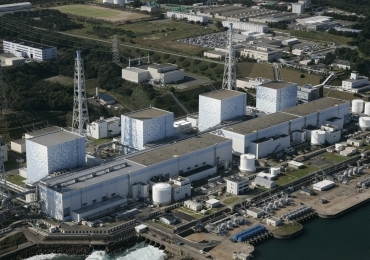 Tokyo Electric Power has begun new cooling operations to fill the reactor with sea water and pour in boric acid to prevent an occurrence of criticality. 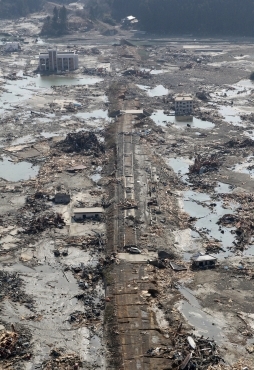 The concerns about a radiation leak at the nuclear power plant overshadowed the massive tragedy laid out along a 2,100 km stretch of the coastline where scores of villages, towns and cities were battered by the tsunami, which packed up to 33-foot high waves triggered by the massive quake. Chief Cabinet Secretary Edano told a press conference that there had been no major changes in the results of radioactivity monitoring near the No. 1 reactor. 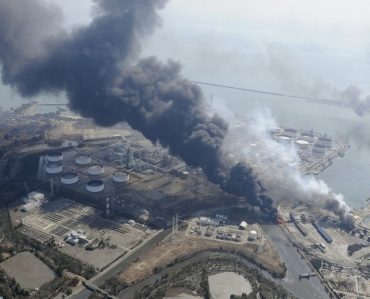 Following the explosion, the authorities had expanded from 10 kms to 20 kms the radius of the evacuation area for residents living in the vicinity of the Fukushima plants. The Fukushima government said on Saturday that three people had their clothes contaminated with radioactive substances while fleeing from the No. 1 nuclear plant. The fire and disaster management agency said separately that 15 people were found to have been contaminated at a hospital located within 10 km from the No. 1 reactor. Edano said there was a possibility that a few people who fled on a bus had been exposed to radioactivity. Prime Minister Naoto Kan issued an instruction to double the number of self-defence forces personnel sent to quake-hit areas to 100,000, one of the largest ever for an SDF operation. 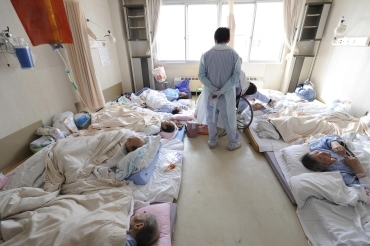 More than 215,000 people are said to be living in 1,350 temporary shelters in five prefectures in quake-hit areas. One report said four trains had disappeared following the quake and still had not been located. International disaster relief teams are being sent to Japan, with the United Nations helping to coordinate the operation.